Early mornig fun. Just changed the driver to use USB (CH340G) and added a separate 12V supply and some jumpers to select power Source. It can now be driven from 12V or 5V and you can use 12V for PWM’s while using USB 5V for ESP32 etc to have some isolation. Also added pull-up for Boot/Reset and jumper to use them. A bit more labels and TVS diodes on the left 12 x IO and we’re done. I must admit that this little fellow will see some usage. My 12 legged robot comes to mine as this is a very small, compact alternative for this one. 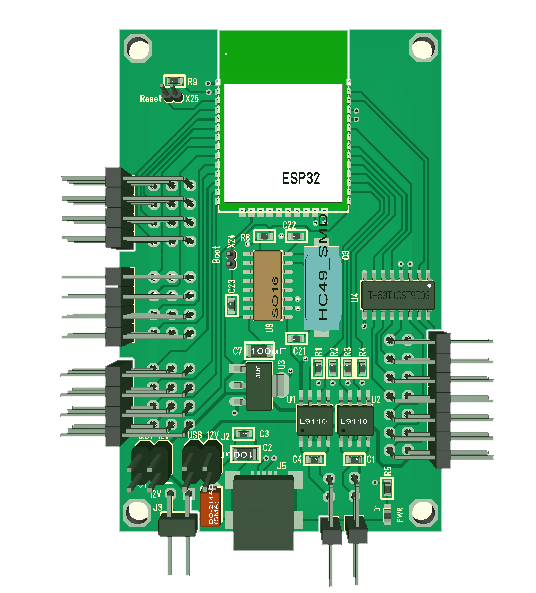 But, I need some experience with using ESP32 before I continue.